As North America’s largest automotive aftermarket retail franchise, LINE-X is focused on providing what you need to customize your vehicle to fit your lifestyle. To further our commitment to the truck aftermarket, LINE-X has introduced an exclusive new accessory line, Truck Gear by LINE-X. Available only at LINE-X franchise locations, Truck Gear by LINE-X is an expanding collection of the most popular accessories for your truck. 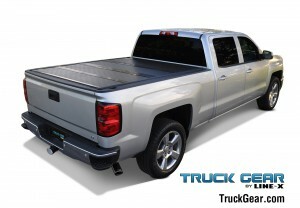 Start with the toughest bedliner on the market, add a step bar, tonneau cover, and all-terrain floor liners for added convenience, all within a LINE-X location and with LINE-X products you know you can trust. All Truck Gear by LINE-X accessories carry the Truck Gear Nationwide Lifetime End-to-End Warranty. This warranty covers your accessories no matter where you live. If you ever have a problem with your accessory you can return it to any Truck Gear by LINE-X Franchise to have your accessory replaced at no cost to you. While a manufacturer’s warranty only covers the cost to replace the accessory, the Truck Gear Nationwide Lifetime End-to-End Warranty covers the accessory and the reinstallation of the replacement part.